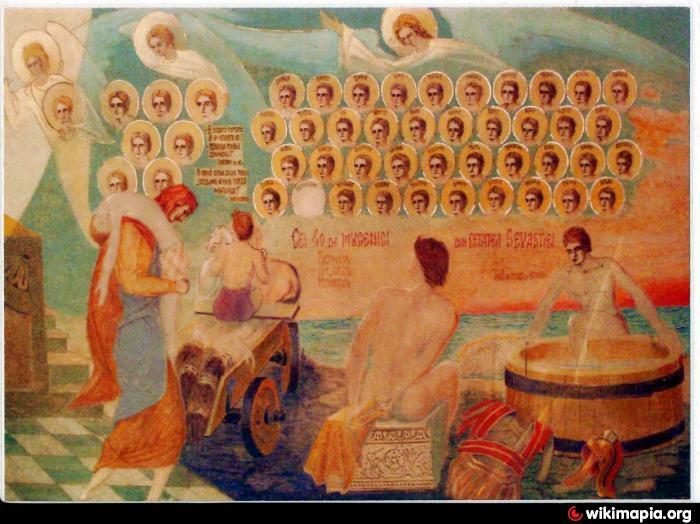 St John the Evangelist and St Amphilochios in Patmos! And an elusive Romanian father Ioann, literally hiding in a North Romania hamlet, who has been praying about him for a long time, and a spiritual sister has made all necessary arrangements for them to meet at long last! Glory to God for all things! Even if no answers are to be disclosed in all these meetings, still so many blessings are under way! There’s something about abandonment that resonates strangely with the human spirit; and the sight of human buildings reclaimed by nature has a twofold effect. Firstly, it hints at hidden histories, at stories and perhaps lives lost – but more powerful still, is the underlying message that reminds us how all things must one day return to the earth. How interesting it is then, to contemplate the decline of our monuments to religion: more than mere function, these structures carry the weight of our beliefs, our dreams, our hope and our faith. From time to time in my travels, I’ve come across the derelict remains of churches; some of them boarded and fenced off in city centres, others left to rot in fields or forests. 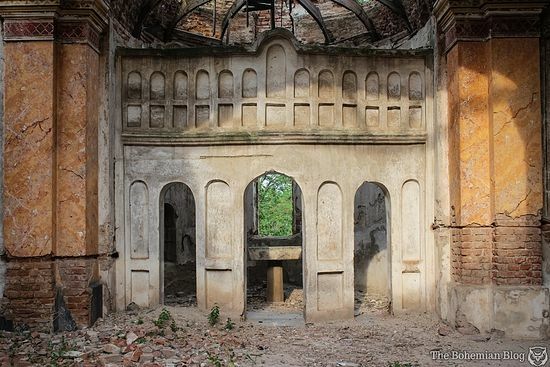 I felt it was about time I shared a few of these locations … and so here are five of the most memorable religious ruins that I’ve had the opportunity to explore. 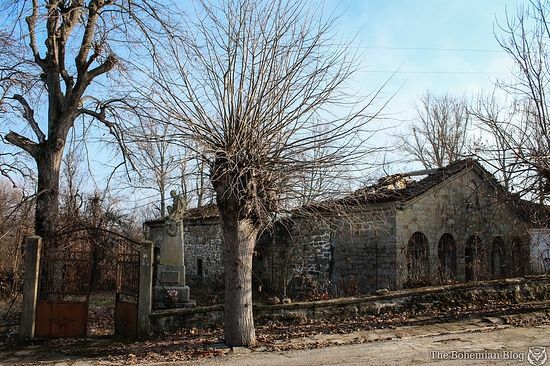 I came across this first site one year ago – on Boxing Day, to be precise – nestled amongst bushes and tumbled stone walls, in the middle of a remote Balkan village. The village was much like many others in the area; half a dozen houses clustered around a potholed road, and half of those properties most likely uninhabited. 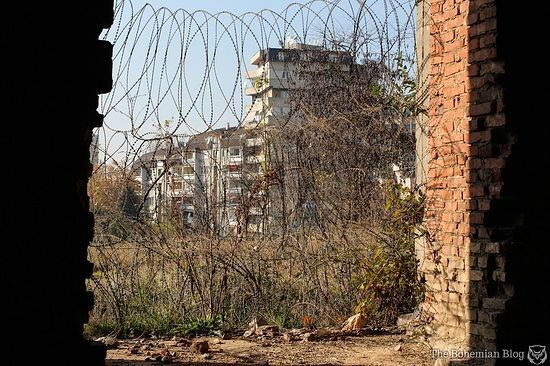 Over the past couple of decades Bulgaria has seen radical depopulation in its more rural settlements, as young people typically move to the cities – or now, increasingly to other EU nations – in search of work. 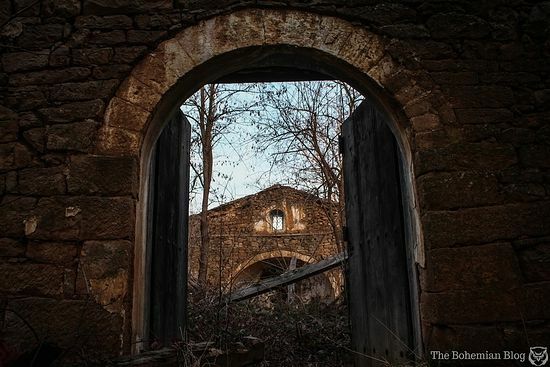 As a result, many of Bulgaria’s more remote villages have begun to look a little starved of life and vitality. From the road it didn’t look like much more than a collapsed barn; the creepers and brambles already taking a hold on the old stones, pulling them down in a deadly stranglehold. 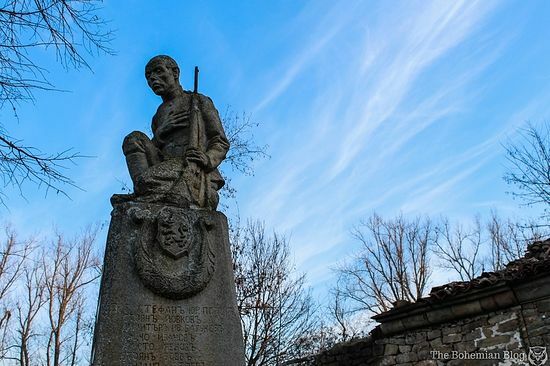 It was a war memorial in the graveyard that caught my eye, however – a peculiar, kneeling figure, sat atop the Bulgarian crest and brandishing a WWI-era rifle. The face seemed somehow twisted at first, but the more I looked the more I read a profound pathos etched into that stone mask. I walked through the graveyard to the derelict building behind, a structure I’d barely given a second look until then. 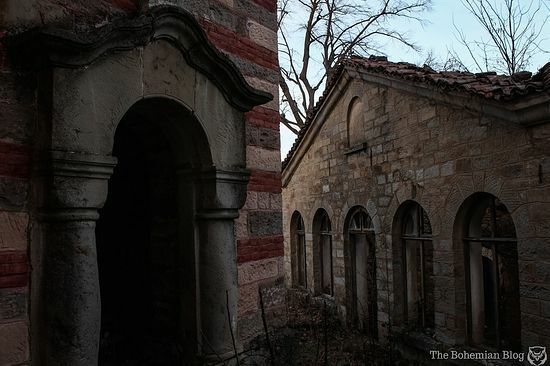 Here though, approaching from the main entrance I was greeted by the faded yet familiar symbols of the Bulgarian Orthodox Church; and stepping through an arched double doorway, for just a moment I was able to imagine the building whole. At a guess, I’d say the church had been built sometime in the early 19th century. 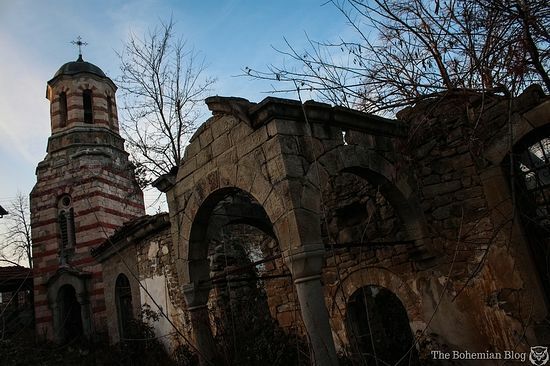 It wasn’t until 1878 that Bulgaria finally achieved independence from Ottoman rule, before which these people were strictly forbidden from building churches that rose taller than the invaders’ mosques. 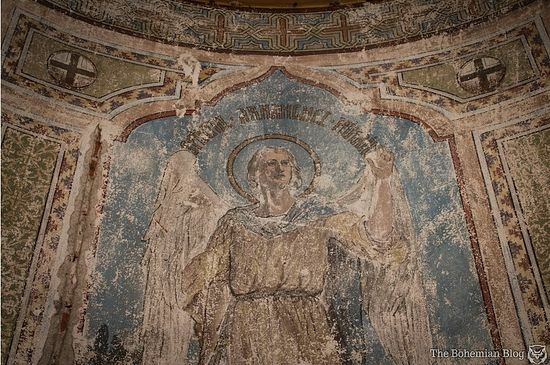 As a result, Bulgarian Orthodox churches built before that were typically dug deep into the ground, to form semi-subterranean spaces of worship that wouldn’t offend their Muslim overlords. This building, approached by a series of three stone steps descending into a shallow, one-storey church, seemed to fit the mould perfectly. 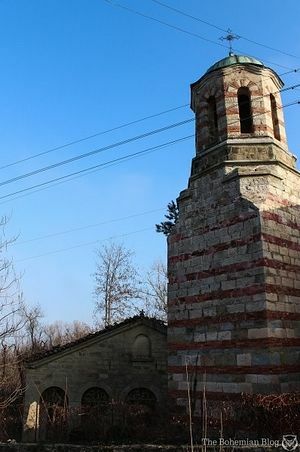 The site also featured a bell tower, built in a more ornate style and topped with a proud cross, which would certainly have been raised post-liberation – such an unashamed statement of christianity would never have met with Ottoman approval. In fact, during those years even bells themselves were banned from churches; the subjugated Christians would rather have made do with wooden clappers, that drew less attention to their heathen practices. 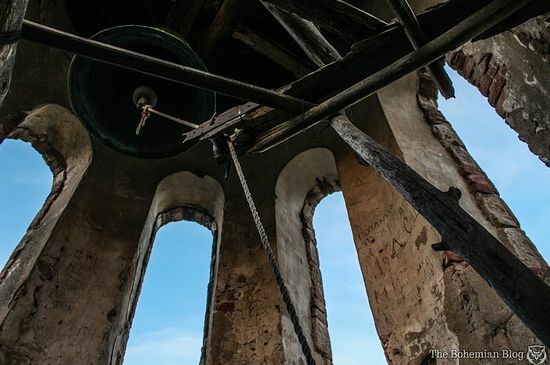 It was sad to see the church, along with its more recently acquired bell tower, in such a squalid state of disrepair; the roof had long since been stripped, leaving nothing of value and only old, moss-covered stones to hint at what had once been here. Such is the nature of depopulation, however. 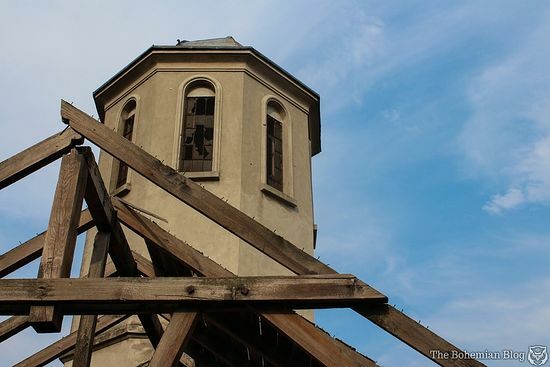 With only a handful of elderly residents left, there was barely a congregation to be found in the village – let alone the work force required to keep the church and tower well maintained. The sun was setting by the time I left the main body of the church. I glanced up at the stone tower as I crossed the graveyard, and at that moment I caught the reflection of sun beams glinting dully on the brass body of a bell. Immediately, I knew I wanted to climb the tower. The bell tower wasn’t tall, perhaps little over four floors high by average building standards. 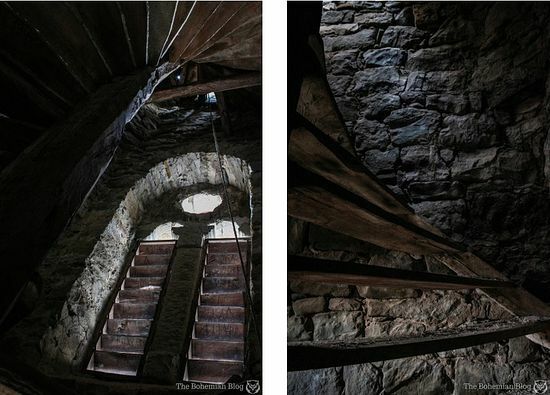 What made the climb difficult however, was the state of the wooden staircase within. Some steps were missing altogether, others splintered, grown over with moss, while just a few seemed to promise the illusion of stability. I spread my weight across as many steps as I could at any given time, taking the climb at a painfully slow rate. The structure creaked and groaned in protest, as I crawled up the rotten corkscrew. At last, however, I made it to the top. Coming round one final corner of the warped and weathered staircase I met a square of blue above – where day’s last light was spilling in through windows in the stone to illuminate the bell ringer’s platform. Pulling myself up and onto the larger beams that formed a floor for the tower’s topmost chamber, I caught my breath and looked out at the view – the sleepy hamlet, the lake beyond, the mountains disappearing into mist. In all the years this church and tower had suffered the onslaught of the elements, wood and stone giving way to the inevitable pull of natural decay, the view itself had likely never changed. Now that I was here, I couldn’t resist but ring the bell. It tolled a deep and dissonant sound that echoed out across the landscape … but by now there was no one left to hear it ring. In November last year I took a trip to Pristina, the capital of Kosovo. 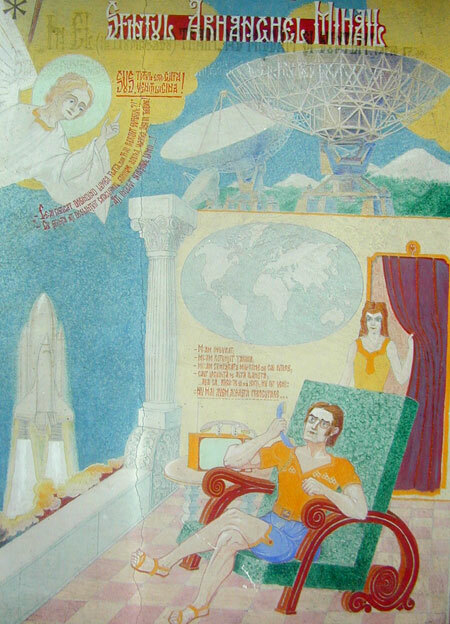 One of the sites I explored that week was an unfinished cathedral, located in a park just off George Bush Boulevard. The building – titled the “Christ the Saviour Cathedral” – is a perfect example of the Orthodox form with its tower and dome, its simple cross placed up top. Here however, in the largely Islamic capital of Kosovo, the unfinished building stands out in sharp contrast against its surroundings. Nowadays this building (and what it stands for) is caught at the heart of a heated political debate. 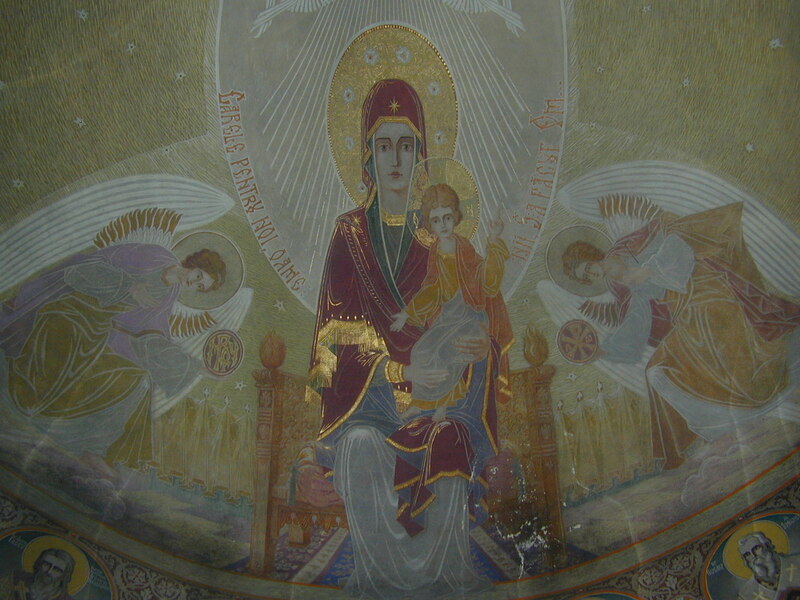 Construction began on the cathedral back in 1995, when it was intended as a place of worship for Pristina’s Serbian Orthodox population. 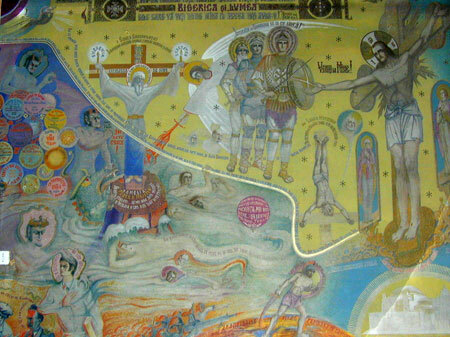 Things would soon change however, with the outbreak of the Kosovo War in February 1998. 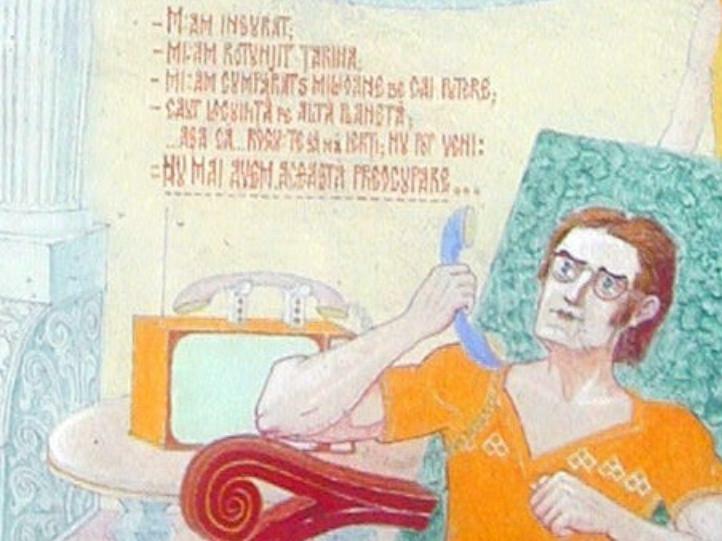 The construction project was stalled as war ravaged the country, Albanians pitted against Serbs in a battle for independence. 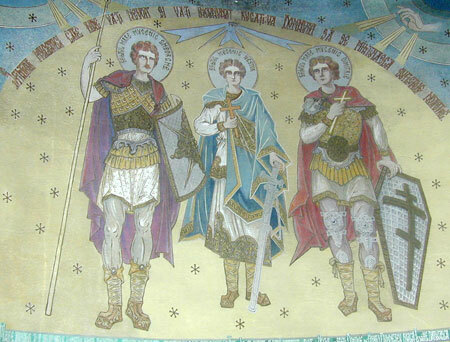 The following years would see attempted ethnic cleansing, bombing raids and eventual UN intervention … and by the time the Republic of Kosovo had been established as an independent nation in July 1990, the unfinished Serbian cathedral in its capital had become an uncomfortable reminder of their past oppression. 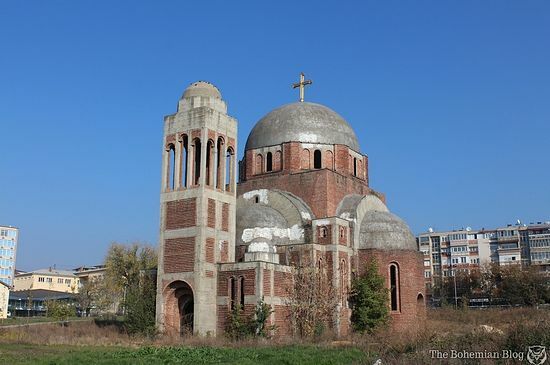 Built on the grounds of Pristina University, the Christ the Saviour Cathedral remains a brickwork shell to this day. 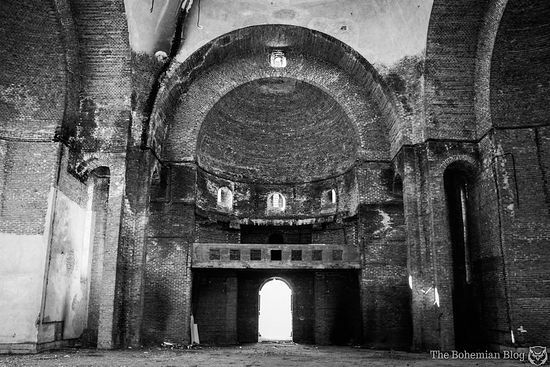 It isn’t guarded, and the construction team never got as far as giving the building doors which might be locked to keep out trespassers; and so I sauntered in freely, to explore the vast brickwork arches and domes of a cathedral that never was. 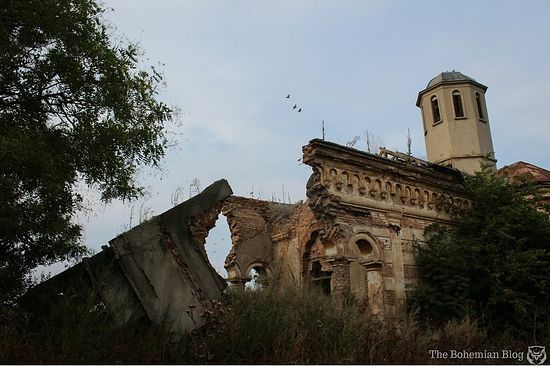 “Every time I look at this ruin, it reminds me of our victory against the Serbs,” my friend told me over burek and macchiatos. Inside the cathedral I caught the scent of something foul, and turning a corner, I found that the altar space had recently been used as a public toilet. Whether this too carried a political message – or was simply the work of someone who’d been caught short in the park – I’d never know. 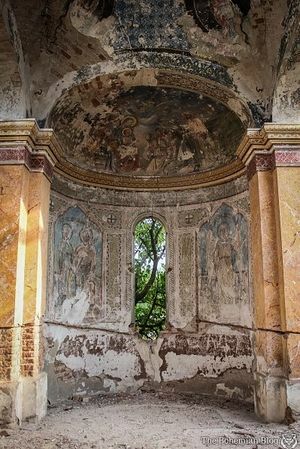 Perhaps the most beautiful building featured on my list, this Romanian Orthodox church was also the most severely dilapidated. 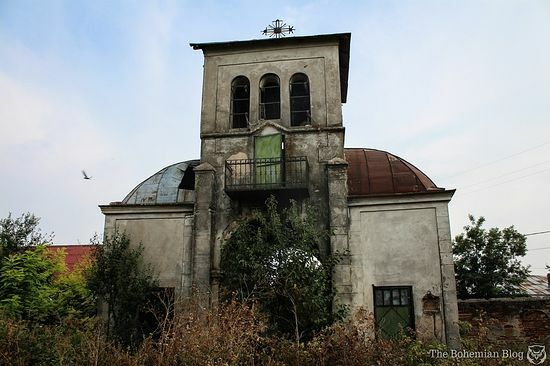 The church lies on the edge of a tiny village, surrounded by open fields and roughly an hour’s drive from Bucharest. I never would have found the remote location on my own, but rather I made the trip with my Romanian friend Ovidiu, and co-conspirator Nate (the man from Yomadic). 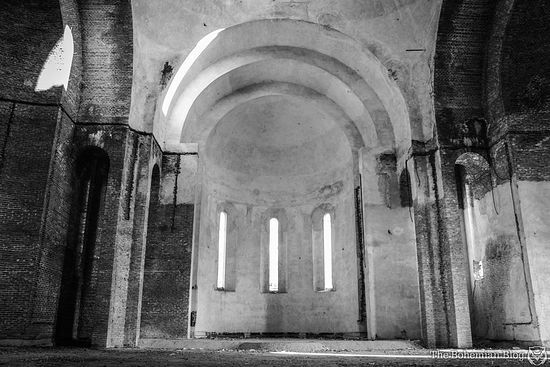 Ducking beneath a lintel of jagged, severed bricks, we stepped into the church through a breach in one wall; a breach created after one large section of the building had torn away altogether, to crumble into the long grass. Immediately I was struck by the simplistic beauty of the place. Frescoed walls and pillars in warm shades of orange, delicate arches and the most exquisite murals painted in blue, gold and red. Unlike the building above, which I had witnessed being pulled aggressively apart by power tools and bulldozers, the ugly work of human hands and gas-fuelled vehicles of destruction, the atmosphere in this place was altogether different. Here there was a sense of balance, a serenity about the decay, as green growth sprouted out of old bricks … and vines reached in through windows to steal the minerals back from the very walls themselves. The death of this church was a beautiful thing, a painless passing wrapped within the loving arms of mother nature. 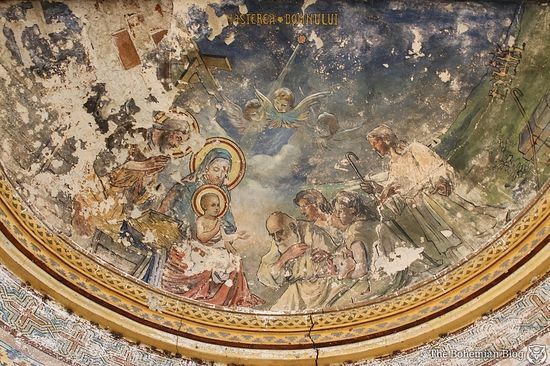 Though the space inside was small, we spent a good long while exploring it – most of that time poring over faded frescos, admiring the painstaking detail in every scene. At one point we even climbed up onto the walls themselves … moving slowly, ever cautious not to dislodge the stones. From the broken end of the nave we looked down on the altar from above, our view level with the bell tower that somehow, against all odds, stood tall and square above the ruin even now. Outside the church, where the graveyard bordered onto a small village square in which children chased chickens and three old women in shawls had sat on a wooden bench and watched us pass, there stood a gatehouse. Like the church, this building too had clearly seen better days – but for now at least, it managed to maintain some structural integrity. I decided to climb it. Stood beneath the stone archway, I ran my hand through the space where once a staircase would have been – wet chips of rotten wood now hanging in heavy cobwebs, while the chewed-off ends of steps still jutted out of slots in the wall at regular intervals. There was a square hatch above, leading to the tower room with its balcony – but 10 feet up without a ladder, I wasn’t going to get there on my own. Using Ovidiu as a human climbing frame, I managed to get a hold on the ledge above … before pulling myself up and over the lip, rolling into a square grey chamber adjacent to the central tower. The space inside the upper portion of the gatehouse had, apparently, long since been taken over by the pigeons. 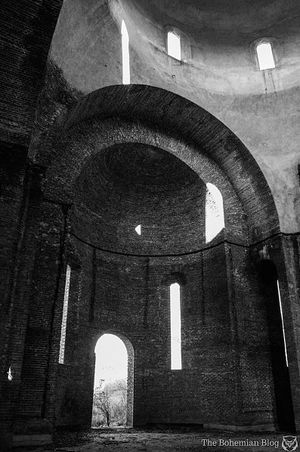 Moving through the mounds of muck and feathers, I crossed to where a wooden hatch opened onto the central tower. Above me, sunlight streamed in through a wide rent in the tin roof. The main tower of the building had lost its floor – where once the boards had been, now only a couple of wooden planks extended from one end to the next, a delicate balancing act above a 10-foot drop. I put my best foot forward, placing it on the wooden beam with the hope of crossing, and making it out onto the balcony beyond. It wasn’t to be, however; the moment I put weight on the wood I felt it shift beneath me, the surface crumbling to a grit with the texture and consistency of coffee grounds. I took one last look at that door opening out onto the balcony, then looked down again to the powdery mess my foot had made of the walkway. Nope, I thought, not worth it. Before we left, the churchyard had one more surprise in store for us. 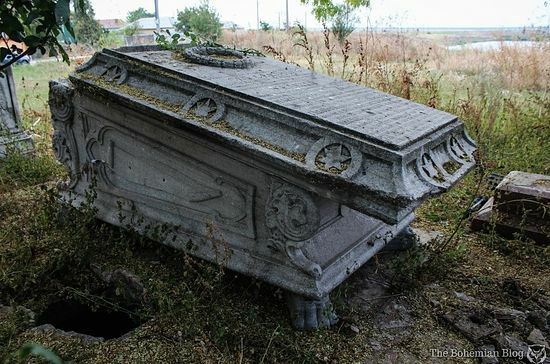 Beneath a nearby tree there sat a heavy stone sarcophagus, its lid carved with ornate script and a sculpted wreath. 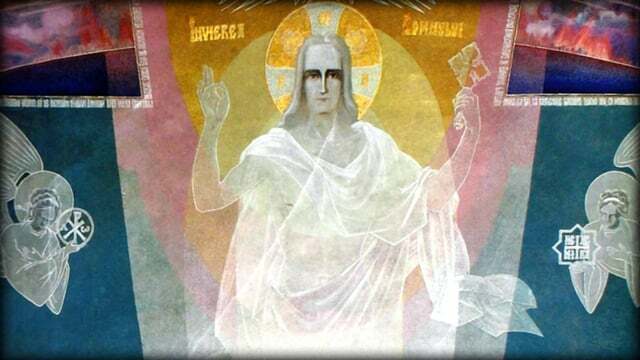 At each corner, the tomb was supported on stones fashioned into the shape of feet. I was just admiring the letters carved into the tomb, when I spotted a square hole opening up in the earth beside the sarcophagus. It was deep – too deep to make out the bottom – and suspecting I might be stood above some kind of buried crypt, I began looking around for the entrance. 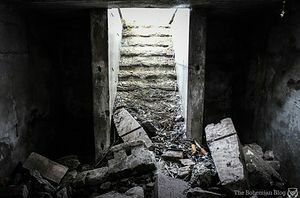 We found it, sure enough; a series of slab-like steps that descended beneath the graveyard, into a deep, dark chamber filled with stones and rubble. The space wasn’t large, and felt all the more cramped for the piles of broken things which had been cast down from the opening above. 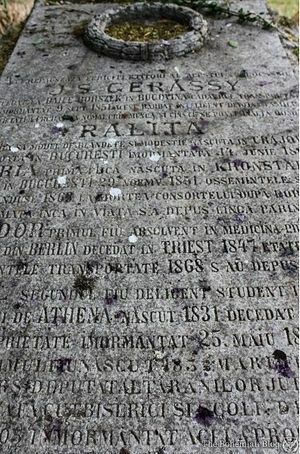 There were cracked tombstones, pieces of pillar, even shards of splintered wood; presumably from coffins. And after that we bid the church farewell. In one sense it was tragic to see such art left out to rot, and I wondered why no effort had been made to preserve it; the more time I spent in and around that building however, the more I experienced an inexplicable feeling that everything was exactly as it should be … and from then on I was simply grateful for the opportunity to admire the church before it had been swallowed back into the earth altogether. My last location was not abandoned; neither was it a church, strictly speaking, but rather a picturesque little monastery nestled beneath a cliff in the mountains of Bulgaria. 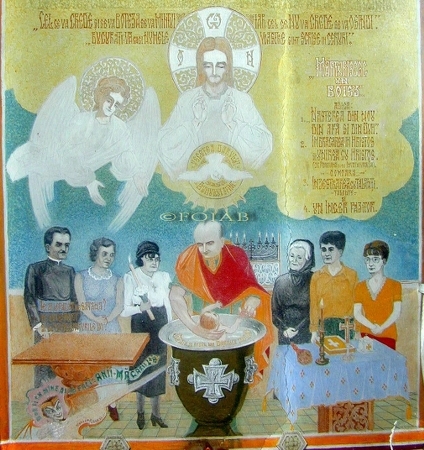 While the monastery itself was undoubtedly beautiful – not to mention unique, at least in terms of structure and geography – my main reason for visiting the place was a small, half-buried chamber that would usually not be seen by visitors. Stepping around the corner of a chapel, we followed the graveyard path that wound around and down; a flight of stones steps descending to the cellar door. We tried the handle and though the door was stubborn to open – the wood swollen from moisture – it had been left unlocked, as expected. 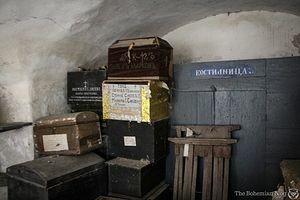 Many of the boxes were labelled with names, presumably corresponding to the one-time owners of the bones that lay inside. I wondered where these bones were headed – or if these wooden boxes were indeed the final resting place of monks, martyrs, or whoever else this may have been in life. Not all these holy bones were hidden though, and on a recessed shelf at the back corner of the crypt were arranged a series of human skulls. 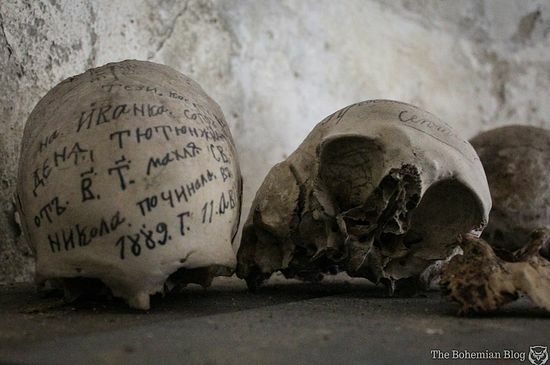 Following the same tradition I saw on my recent visit to a Czech ossuary, these bones had been boiled clean … but after that, the monks here had painted names and dates across each skull in delicate brushstrokes. The effect was strangely beautiful; a repurposing of death, skulls used in place of headstones. These bones had served as vessels of information in life, why not allow them to continue to speak beyond that point? 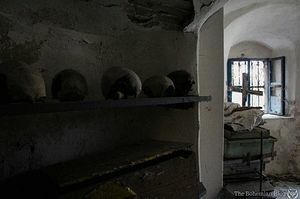 It did trouble me a little to see the bones left open to the air … the skulls on the shelf showed signs of disintegration, while the stacked boxes were beginning to collapse under the weight of those piled above. Perhaps, though, such desire for preservation is itself an unnatural urge – maybe it’s healthier to accept the passing of time, and to embrace the inevitable decay that comes with it. These skulls seemed to serve the purpose of memento mori in every sense: both a reminder that all things must end, and also an admission that such processes can yet be beautiful.